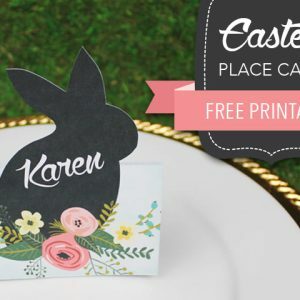 A few weeks ago, The lovely Anna from Download and Print made her debut on the Blog with this FREE Printable Invitation and RSVP Card Template. The download proved incredibly popular with people still visiting the blog on a daily basis to download it. So today Anna is back to the blog with a brand new FREE printable. 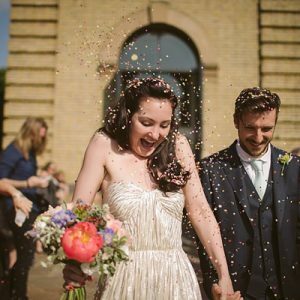 Today Anna is sharing with us this gorgeous Folded Wedding Program, or Order of Service, perfect for any wedding ceremony. The download can be found HERE. Simply follow the easy instructions and it will both be downloaded to your computer in a matter of seconds, ready for you to customise. STEP 1) Download the template files and open in MS Word. 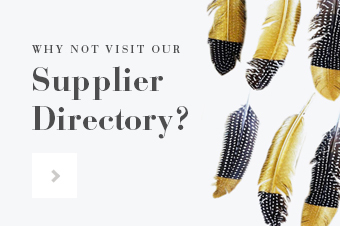 Customise with your details. The scrip font used in the example is Parisienne and the information text is written in Trajan Pro, both of which are available for a free download. 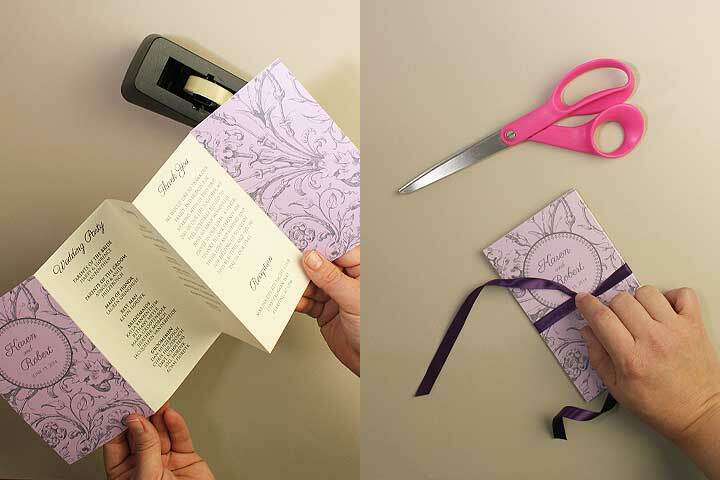 Print the files on A4 cream card stock. I recommend printing one program first to check for typos, before sending them all to print. You can also take the file to a copy shop for reproduction, but print one copy at home first just to be on the safe side. If you decide to use a copy shop, take along this release letter stating that you have permission to print the file. 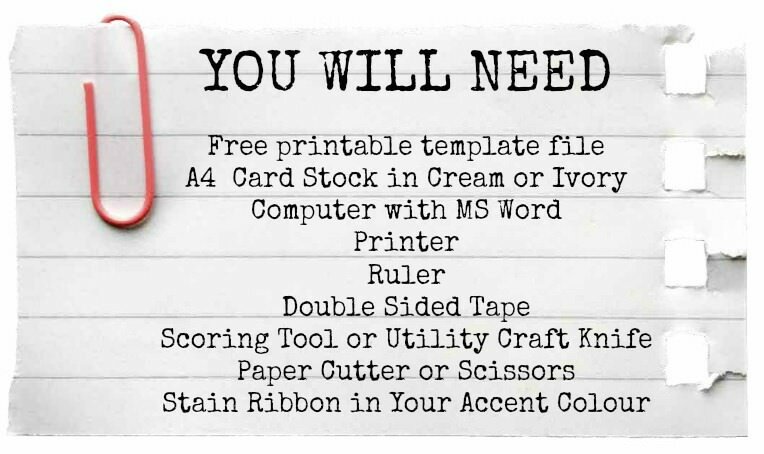 TIP: As this is a black and white file you can also print on coloured card stock. 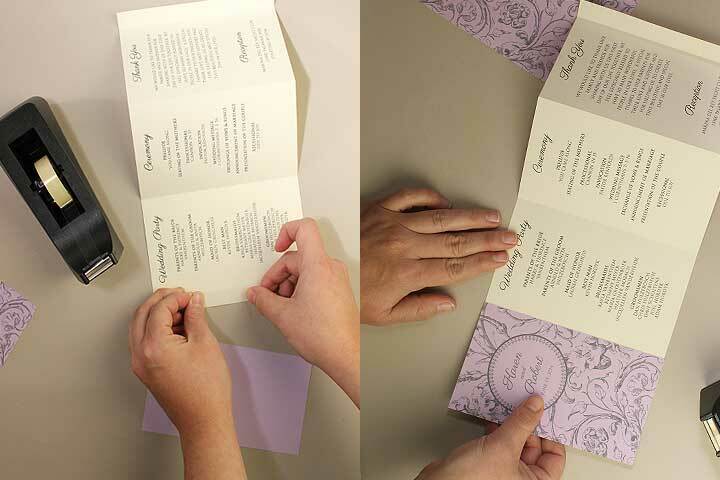 Match the card to your wedding colours for a completely unique program. 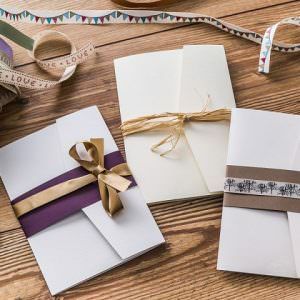 Use all the same colour card, or coloured card for the front and back covers, and cream or white for the inside pages. Be creative! 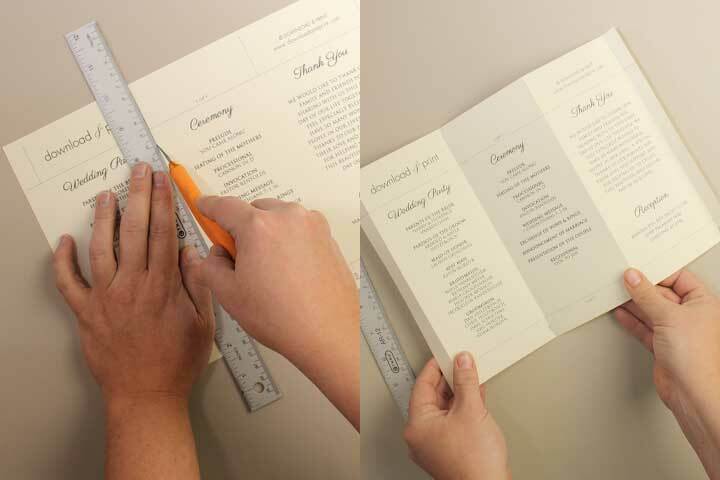 STEP 2) Score along the fold lines using your scoring tool or the back of your utility knife and a ruler. Do not cut! This will give you sharp creases and help the program fold flat. 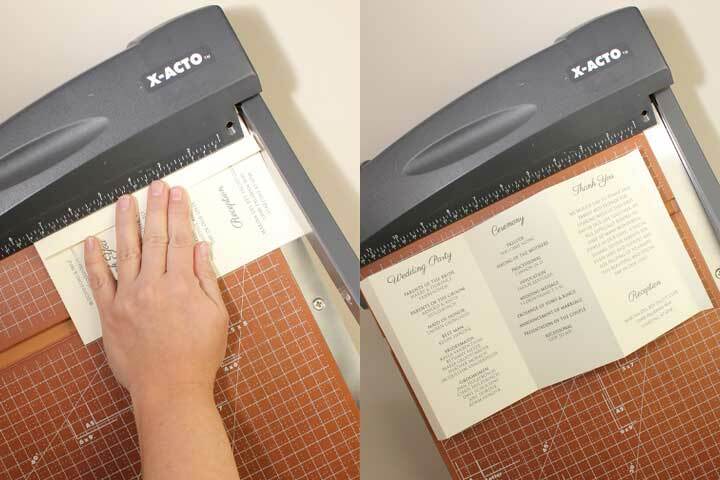 STEP 3) Accordion fold the inside pages and trim along the cut lines using your paper cutter or scissors. 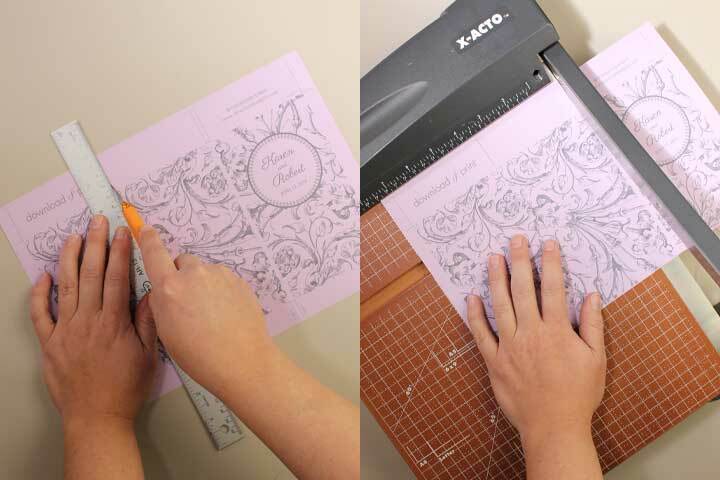 You will be able to work more quickly with a paper cutter and will get a straighter edge, but scissors will work fine if this is what you have on hand. STEP 4) Again, using your scoring tool or the back of your utility knife, score the fold on the back cover to a sharp crease. Trim along the cut lines. You should end up with two pieces, the front cover which is a single panel, and the back cover which is a double panel. 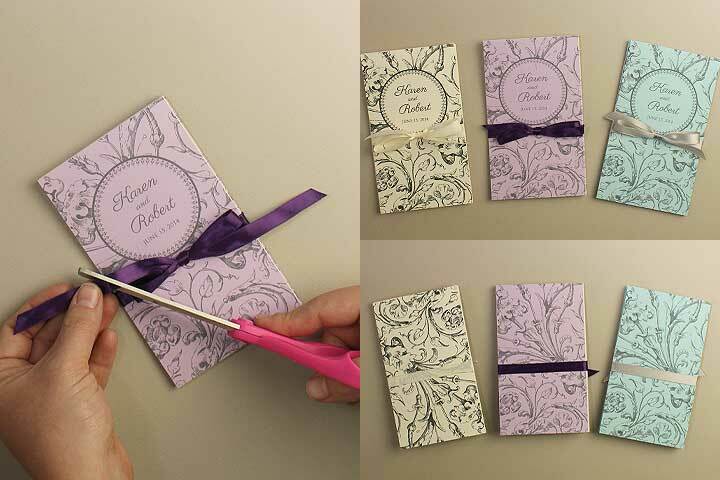 STEP 5) Attach the front and back covers to the inside pages using double sided tape. Tape works better than glue and is less messy! 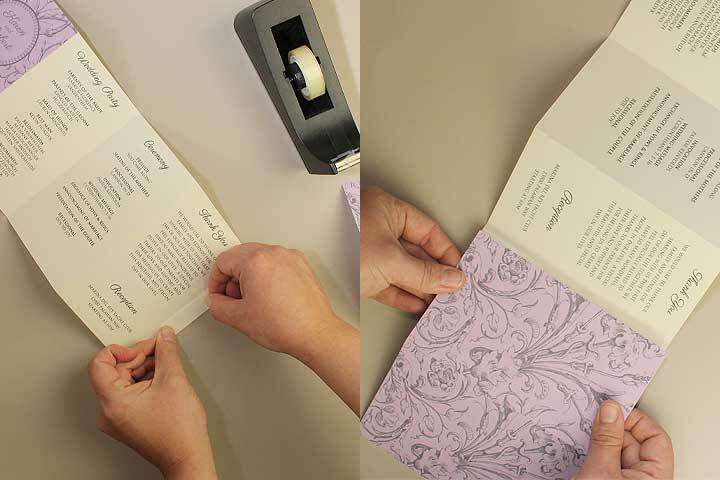 TIP: Before committing the tape, lay out the program first and do a practice fold so that you can see which way the covers attach to the pages. All the printing should be on the same side. 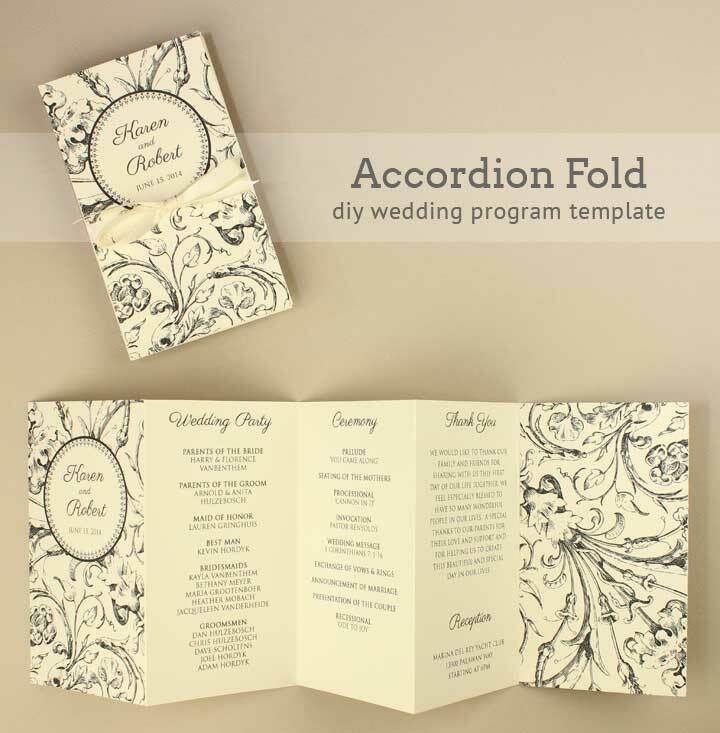 STEP 6) Close the program in an accordion fold. Tie ribbon in your accent colour around the program and trim the bow tails to the same width as the program. 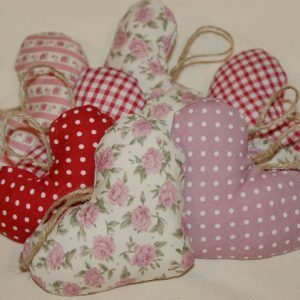 TIP: The assembly process will go much faster if you recruit friends/family/fiancé to help and form a production line. Have someone score and fold, have someone tape, and have someone tie the ribbon. I recommend you don’t have your dad or fiancé tie the ribbon. In my experience the bow tying gene is missing from most males! STEP 7) Step back and admire your work. 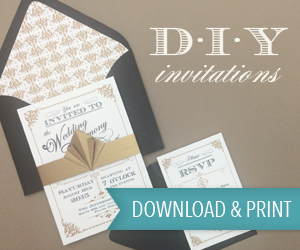 Thanks so much to Anna from Download and print for this gorgeous downloadable DIY Tutorial. Anna will be back in a months time with another FREE download for you. I love this layout. Would I be able to print on both sides of the program? I noticed the in the example their are no Jr. 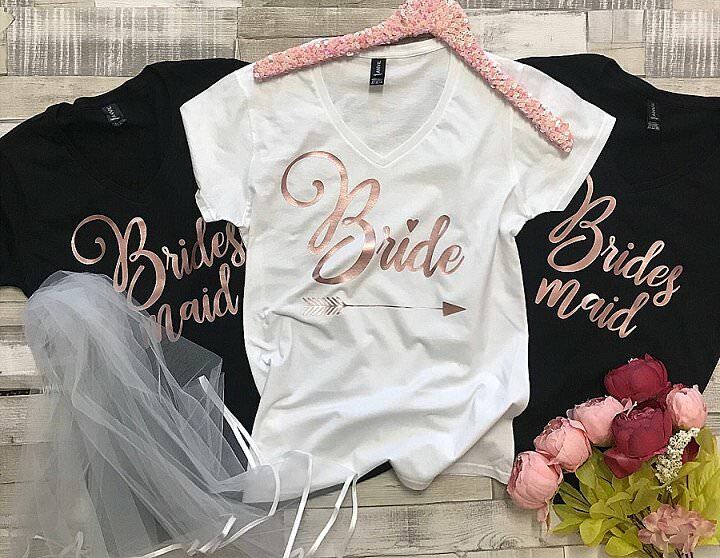 Bridesmaids, Flower girls or ring bearers. Thank you so much for this free downloadable program. It is just what I was looking for. Help please. It says that it is free, but when I go to download, it comes up that it costs 18$. What the heck am I doing wrong? Thank you very much for this template! It’s very beautiful and surely will be a great eyecatcher! Greetings from Germany! OMG, this is such a beautiful design and exactly what I was looking for! A million thanks for sharing with us! 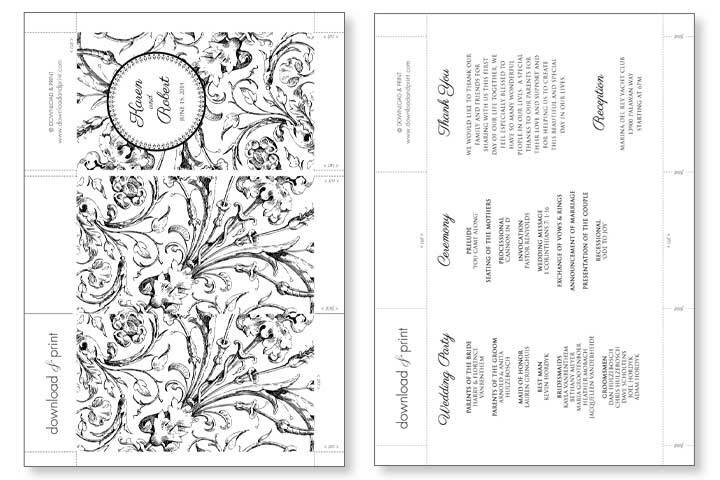 I am also going to use the design (floral only) for the back of my menu cards to put at each person’s place setting. You may want to consider doing another template that just has the flowers on there and no names. Then on the other side you could write “menu” and Do it Yourselfers can just fill in. I would post a pic of it but it does not allow me to. Cyber hugs! (You saved me about $500)!! Thank you so much ! This is going to save my wallet! but how do i get a template for the colored version? I love this and this would be a part of my stationary for the ceremony. I downloaded and amended the template to my vision for the programme. Beautiful! Everyone loved the look and I aIso placed information on the back of the inner card.